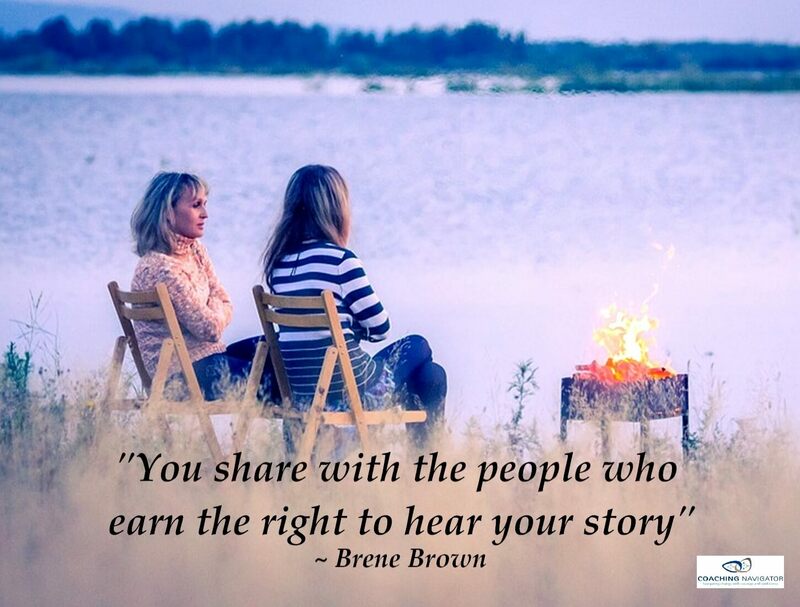 A proven conversational change process for handling conflict with self and others. Conflict Evolution provides a conversational method for dissolving situations and issues that hold conflict in our day-to-day life. This process works both personally and professionally. Bringing 20 years of leadership and coaching mastery at work and in life, we provide on-going training to our graduates. Please see Our Community for more information. If your office or team would like us to visit for a Lunch & Learn with you, contact us. Non-profit organizations are given special opportunities to participate in our programs. Call Alani to make arrangements. The Conflict Evolution team sponsors introductory evenings for invited guests, once a month on Tuesdays, to share how Conflict Evolution can lower stress significantly. 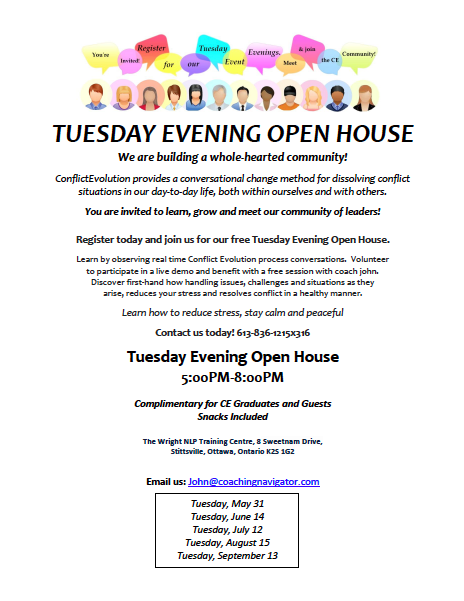 The Tuesday evening introductory open-house is our free monthly opportunity to learn about the unique nature of rapid change and dissolving conflict with our 5 step 20 minute process. You will get to experience real time demonstrations of the process and how this unique protocol significantly lowers stress. You will see the difference. Choose this time to release an old or ongoing conflict with Coach John. The majority of our coping strategies, for keeping the stress of conflict ‘at bay’ are all just part of the process with which we work. In the natural practice of ConflictEvolution we acknowledge coping strategies respectfully. Yet without letting those coping strategies, ‘drive the bus’ and make the decisions that set up results big and small, all day long. We learn our ingrained, and even unconscious, coping strategies from our family-of-origin at pre-verbal and early development stages. We needed these strategies to fit-in; receive the love and care we needed to survive and feel safe. More layers of coping strategies and stress-reducing strategies then add on over the years of school, relationships and employment. Some coping strategies show cultural traits, others follow family lines, and the rest we get to call our own. Unfortunately, all these strategies face the same challenge to success. They do not engage the source of conflict in a way that shows respect for all. They do not yet recognize that we each do the best we can, with the level of awareness and resources we have available in the moment. These coping strategies ask us to pretend that we do not have a connection to the others involved. As well, traditional coping strategies rarely include an outcome for Win-Win – Thrive! Engaging the energy of conflict presents us with a process. Neither a hard-and-difficult nor soft-and-easy process, it exists simply as a natural, inclusive process. Just like going from crawling to walking upright, it takes time to learn to balance. Just like relationships, it takes practice. When we choose to recognize conflict as a natural, evolutionary energy, we also choose to begin to see that energy differently. After all, it’s just energy. Then we use our new tools to access a state of resourcefulness, with breath, gratitude and curiosity. Could a new, unseen solution emerge; possibly something even better than we have yet to imagine? With our resourceful state, we can ‘lean into’ the energy of conflict. It may feel uncomfortable, initially ‘not knowing’ the outcome. “Not knowing” triggers our reptilian brain into ‘fight-flight-or-freeze’ survival behaviour. However, much of our daily conflict does not present a life-or-death survival issue! So we have another, also natural process, to work through the energy. It requires that we actively engage all of our brain, heart and body. It requires that we bring our whole self together working as a team. Conflict presents an energetic invitation to grow and find a better solution. To move through the situation that caused the conflict. The energy of conflict invites us to find a new way that works for everyone, so we can thrive together. If we humans are also ‘hard wired’ for love and belonging, clearly we are meant to thrive together. 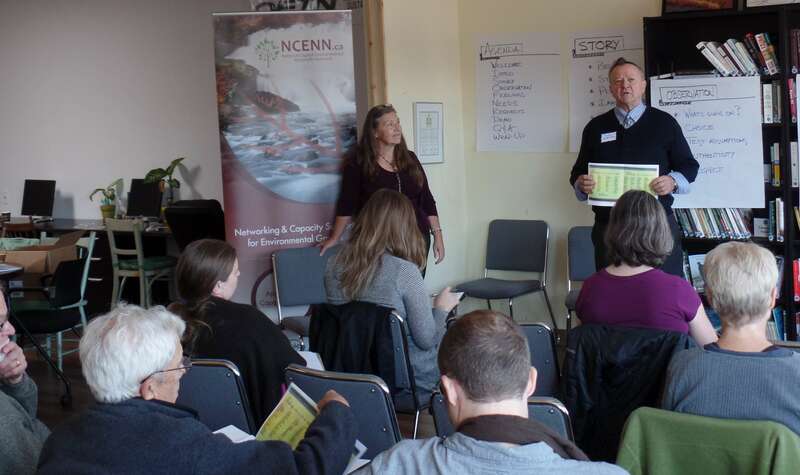 Conflict Evolution provides a natural way to find the higher level solution to meet our needs: Autonomy, Integrity, Interdependence, Physical Well-being, Fun and Connection. We naturally move toward meeting our needs, each in our own way. Learning to live in the ‘not knowing’, in the uncomfortable unfamiliar, with uncertainty has value beyond measure. One who can stay in this ‘not knowing’ has achieved ‘super-power status’! Only in this ‘messy’ space can new potential and possibility begin to grow. All the new experiences we need to thrive in life have their seeds here. It’s a process. It’s possible. It can work in remarkable ways! It takes time and courage to learn. Just like walking the road of life together, talking and loving each other.